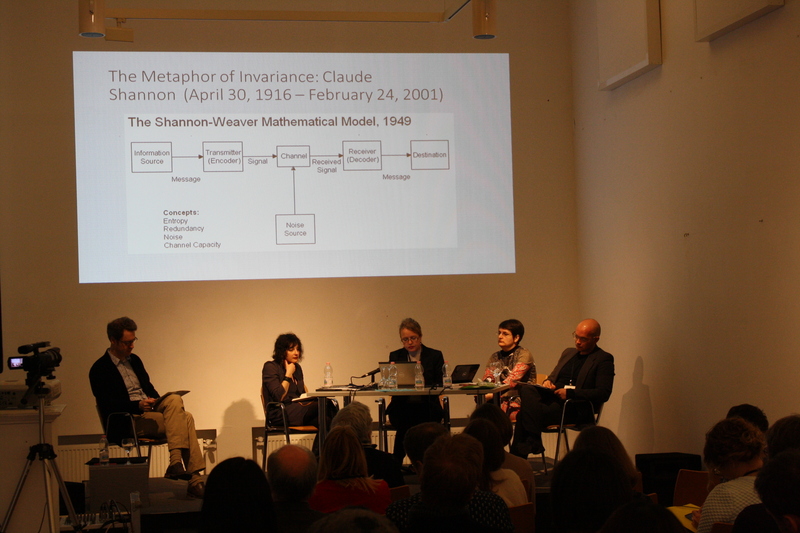 The conference, initially about the epistemes of images and representations within archives, turned into a conference on the many diverse conceptualizations of archives, as the first panel anticipated. The 19th century drive to develop the epistemology of history as a scrutiny of the relation between the part and the whole (as discussed by Mario Wimmer in his talk on Matters of Historical Imagination) is not only of continuing relevance, but actually reinforced by the conflict between fantasies of mass access and questions of relevance, fine tuning of retrieval and object-based research. It is interesting to note that the analyses of representational practices in a digital landscape have been accompanied by discourses articulated on a linear model of communication, manifested through objectifying “archives” and “the public.” Ideas about recursivity, de-localization of archiving, and autonomisation of perception (addressed by Orit Halpern in her talk about The Archival Eye: Cybernetics, Temporality, and Perception in the Post-War Image), as well as appeals to the reconsideration of one-way interaction models (Gabriela Ivacs, Ephemeral Archives, Ephemeral Data: a Critical Approach to Archival Preservation), coexisted at the conference with the need to regard the archive firstly as a fragile corpus of data, rooted in specific material and ideological worlds. There was a feeling of object-nostalgia throughout the conference, either in terms of object-based research spurred on by the discomfort of seeing images circulating as illustrations (Viviana Iacob and Adriana Mihai, Grivita 1933: Recovering Cultural History through a Participatory Digital Archive), or in ethically-oriented art, rebelling against irresponsible usages of images as pseudo-artifacts—reusable and destroyable as items, not as objects. Pleas for an integral “archival body” (Simona Dumitriu, Artistic Research at the Periphery of Conflict and the Forensic Approach) are not even discourses against the transmission paradigm of the digital landscape: they are critical engagements with archival traditions that resonate with the digital ideologies of re-use due to their dispersive drives of random record keeping. In this sense, imaginative displays of visual artifacts are not just a question of concept and design, but the incorporation of anxieties about nature, provenance, and content, of sensitive archives. On the one hand, “second exposures” of photographs with Stasi agents from the Secret Police archives (as performed by Simon Menner) function as reflexive installations on both the ethics and aesthetics of objectifying the unknown in a world of—still—tangible evidence. On the other hand, the re-arrangement of mugshots from repressive/authoritarian archives through the introduction of cinematic techniques (as in the installations "Diaries of Death” by Kestutis Grigaliunas, “The Texture of Memory” by Dinh Q. Lê, and “48” by Susana de Sousa Dias, discussed by Nataljia Arlauskaite) allows the visualization of atrocity by withdrawing the image from the fixity of the repressive grid. Because of the return of the awareness of the object, histories of visualization engage, firstly, histories of access and visibility. In the case of film archives (such as those described by Barbara Knorpp in her ethnography of the British Film Institute), access is still hampered, not only by the problematic preservation of film as a delicate medium, but also by a clash of visions regarding, on the one hand, storage and mass access, and, on the other, the relevance of, and preference for, the analogue medium. Materialities are as important as their underpinning ideologies in the process of imagining the types of narratives certain archives want to convey. Sometimes, the lack of nuanced narratives may leave entire archives devoid of a place to belong: the story of Soviet amateur films, lying between official and non-conformist practice, is not necessarily one of ignorance and negligence, but one of a not-yet-found discursive framework of re-appropriation (Maria Vinogradova, In Search of a Place to Belong: Preserving the Legacy of Soviet Amateur Cinema). The acceleration of temporalities does not make the situation easier. Historians are recording stories together with the technologies that constitute them (like in the Mediascape project of Lviv), and also reflecting on the changing fieldwork of the researcher. The amount of footage of the Ukrainian Maidan (discussed by Bohdan Shumylovych) bring forward not just questions of archiving history while it is unfolding on something as elusive as personal digital media, but also of reconsidering the historical profession as a collaborative and activist one. One would expect that discourse about interaction with, rather than possession of, the archive, would prevail in a conference about digital platforms. They turned out to be discursively separated from the more tangible concerns, both in theoretically specific or practical ways. Instead of a convergence, one can see a further distancing between the “theory of the Archive,” now solidified within the field of performance and theater studies (Micha Braun, Katalin Cseh), and the need for transposable and transversal concepts for different projects. Relativistic claims about the illusionary facticity of documents are challenged by the need to approach hybrid archives with hybrid theories, and by the need to replace the contestation of objectivity with an analysis of how relevance is created (the case of “expired” and redundant Cold War archives discussed by Ioana Macrea-Toma). The exploration of technologically-based creative interventions, while critically addressing the underpinning ideology of infinite performativity, is thus an important issue. Among the practitioners, designers (Kilian Krug, The Interactive Research Table. Visualizing Relations in Digital Archives) optimistically endorse the idea of data visualization as visual thinking-models which might reverse the sequence of the research process: questions might arise from the data, rather than predating the data itself. One problem arising from this approach is not necessarily that the issue of the cyclicity of the interactive nature of question-data is overlooked, but that the accumulation of Big Data is conceived of as a comprehensive practice in itself, without consideration as to what counts as a category of classification. Virtual platforms of things might be nothing more than replicas of museums of things. As it was shown in regard to video art (Stephanie Sarah Lauke, Archival Images of Second Hand), the “productive” reception of archivals is still not especially strong, and, at least in the specific case of video art, “convergent archivals” are still stronger than “relational archivals”; virtual spaces are still virtual exhibitions. The creative usage of digital platforms was articulated as a matter of enriching context by collating collections (Alexander Ivanov, The Soviet Project of the Jewish Agricultural Colonization in the Mirror of Photographic Archives, 1920s-30s) or by highlighting provenance (Viviana Iacob and Adriana Mihai) through combining object-based research and visualization. An unusual creative intervention (presented by Alexandra Kasatkina and Galina Orlova, Performing Analytics through Visualization: Three Faces of In-Depth Interview in the Obninsk Digital Project) is the restoration of the “rawness” of data from oral history by designing layered stages of the transformation of the interview into a text. But, the attempt to perform analytics on interviews did not lead to the publishing of very raw data in the form of audio files together with the text. However, one finding from these presentations might be the envisioning of the technological contribution, not just as the merging of surrogates into larger datascapes, but as the documentation of the process of the source becoming a source: the oral history transcript is the end result of a psycho-interaction that can be viewed and even searched, and the illustrations in history textbooks and sites are reproductions of other reproductions. What would be really interesting to do with the help of digital platforms would not just be to recuperate histories of becoming, but to spur reflection on how the “illustrative” genre of dealing with images is the result of certain regimes of relating to the data and documents. Socialist-realist regimes of repetitive painting are ironically convergent with the “forgetfulness” of digital reproducibility, and thus contribute to the oblivion and expiration of propaganda-driven art. In this sense, retrieving context is not just a matter of combining and integrating evidence according to standards, but one of confronting discourses about what counts as evident. Visual traces such as photographs are highly ambivalent in this regard: their meaningfulness is not only driven by thematic or [inherent] aesthetic features, but is a matter of dealing with repetitiousness itself as meaningful or not. As a special genre of emotional identification, family photographs both elude and intersect with larger narratives, and therefore are either over- or loosely contextualized (Oksana Sarkisova, Archiving Private Lives: Domestic Film and Photography in the Digital Age). Taking one symbolic step further in the interrogation of the tangible presence of the past on the longer-term, artistic projects like that of Dave Griffiths (Babel Fiche: A Video Museum for Future Citizens) symbolically address the issue of redundant micro-display (through microfilm frames) as a sustainable medium of translating knowledge into a future age. It also resonated with Orit Halpern’s exploration of the immediacy of cognitive navigation of serial images as a future, post-human “reading” skill. Immediacy of perception was further developed in the panel on atrocity and forensic archives as an investigation of the self-conveying power of practices and artifacts related to violence. Lee Elizabeth Douglas highlighted the concerted processes through which evidence becomes recognizable and therefore evidentiary, and Virginia K. Dixon questioned the truth-telling capacities of satellite technologies. While focusing on the theme of human rights violations, the panelists addressed broader issues: they analyzed repertoires of “techniques of presentation” as objectivity-making claims within different expert cultures, but also within the ultimate reconfigurable archival space (Csaba Szilágyi, CSI: Forensic Documentation in the Archival Space), torn between the necessity of providing solid factual background and the endless possibilities of re-imagination through aesthetic de-territorialization. The conference proved that, before addressing the computational capacities of digital humanities, questions related to means, forms, and definitions of contextualization need to be asked. The visualization of data revealed the need to first re-assess visibility as a matter of relevance of sources and historiographic imagination. It also showed that rendering artifacts legible within the digital domain requires not just a new type of collaborative scholarship, but archeological and technological visions of past and future regimes of data recognition. Already ambivalent in material form, images are liable to different forms of contextualization, through collation with textual forms, serialization, accretion, and re-use through transmedial creativity. The practice of “curating” brings together, now more than ever, historians, archivists, designers and, artists, due not just to emergent visual typologies, but also due to emergent forms of sensibility in research inquiry. Artistic perspectives, thorough documentation, and an understanding of the technological possibilities, will all be part of the building of transmedial forms of argumentation through images and imagining.